Want it autographed and in print? Warning: The damsel saves the dude, and that’s not the spoiler. It’s a clue that things are about to get hot. Really hot. Whispy white, ghostly gray and bleakly black smoke rolled into the air. Adrenaline, easily as addictive as morphine, rushed through Delancey Winston’s veins. The closer the fire trucks got to the scene the more sinister the sensation of dread became. The men beside and across from her on the truck carried on conversations as easily as if they were sitting around the table in the dining hall. It wasn’t her first day on the job. It was her sixth. She still lacked the ability to view the moment as a casual one. Maybe she was too new to the job, or maybe her mother had been right. Shudder at the thought. Mother being right. That was an event she never wanted to see come true. “You won’t last a week,” Mother had said, claiming Delancey was too empathetic for a job where people could get hurt or worse. What she’d really meant was weak, because in Mrs. Miriam Winston’s mind women were built for the delicacies of life. Of course, her mother didn’t take into consideration the fact that when Delancey wasn’t working at the firehouse, her work as a physical therapist had her dealing with injured people almost daily. As a firefighter she had a more direct role in the moments that might lead to injury and physical therapy. If she did her job well she could help people avoid the need. Her mother would never understand or accept that though. No, Mother would prefer Delancey’s only job title to be Society Wife. Then she could give up the meaningless pursuit of heroism—Mother’s words—and make a real difference in the city through volunteer and charity work. Another shudder shook Delancey’s shoulders beneath the heavy coat of her turnout gear. As they’d approached the area of town going through a revitalization, having heard the report of trapped civilians, Delancey’s heart pounded harder. She’d faced fires before. Running into a burning building wasn’t a natural instinct, but was instead one she’d forced herself to adopt. Still, every moment of her training replayed in her mind as she went over the protocols. Before her first shift, she’d studied old reports to get to know the men she’d be working with. She’d studied how they worked together and who typically took on what roles at a scene. Before and since, she’d practiced countless drills and putting her heavy gear on. Nothing had come easy, but she’d rebuilt herself into someone strong enough to handle the demands of the job. No matter how heavy the gear was or how badly it restricted her partially diminished range of movement, and no matter how much she hated the mask, the guys in the company would never hear her complain. She became one of them when the alarm sounded at the station. Instinct kicked in and she went through the same steps as her counterparts to get dressed and on the trucks fast. Moving quickly wasn’t enough to prove herself to a group of experience-hardened men who were proving tough to win over. Even if one of those men was family. It would take something big to prove herself. Something big she could combine with intelligence and luck. “You can’t possibly be worried I’m going to wipe out.” Delancey smirked, knowing Andy would understand her meaning. She wasn’t the same girl she’d been when he tagged along on a family vacation to Hawaii. They’d learned to surf together, and regardless how many times he’d claimed she was overthinking things, she’d never wiped out as often as he had. “As if any man does,” Just Jokin’ Jarrett quipped. Since the company had picked up using the nickname Andy had assigned her on that vacation, she’d never get them to stop. So, rather than try, she allowed them to underestimate her because of her size. It didn’t matter if she was petite and what the men called perky. Topping out at five feet and a hundred and twenty pounds didn’t make her any less qualified to be a firefighter than any man in the station. She’d endured the same training, taken the same tests and scored higher on almost every one. She couldn’t lift as much as them in the gym, but she could carry any one of them down several flights of stairs. “Delusional. You’ve always been delusional,” Andy said as the truck rolled to a stop at the fire scene. They were all bailing out and moving to their stations with practiced efficiency as the battalion chief got out of his SUV, also called the wagon, and began delegating tasks, undeniably in control. Delancey didn’t miss the ever-watchful gazes from the men, as if they all worried she would crack under the pressure. She ignored them, though, and moved with Andy, staying right behind him as he’d ordered her in training drills. A single story with executive suites, the newly renovated building had originally been built in the sixties. Delancey’s guess was that the wiring hadn’t been updated during the revisions. She pulled her helmet off, slipped on her face mask and replaced the helmet. A moment later she and Andy were moving together like they had from her first day of training. They approached the flame-filled office, passing a shattered iPhone and two Starbucks cups lying in fresh puddles. Which could indicate that the fire hadn’t been obvious from farther away. Or the person hadn’t been paying close enough attention. Or the fire had started with an alarming suddenness. “Don’t get lost, Delancey.” Jarrett took the lead of the second team who entered with them as they stepped up to the missing doors into the lobby. His voice rang clear in the earpiece in her helmet and she had no doubt he’d be cracking what he thought were hysterical jokes before they were finished. She and Andy had been watching out for each other off and on their entire lives. He’d helped her get the courage to stand up against her mother, and then he’d trained her. She couldn’t have asked for anyone better to face the fire with. Their heavy boots crunched on shattered glass just outside the entrance. The theory of a surprise grew more likely. The moment they stepped inside, the temperature rose considerably. 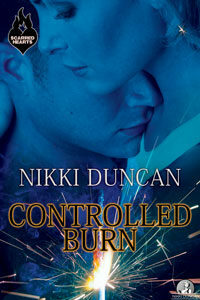 Her skin, despite the protection of her gear, tightened beneath the angry assault of fire. She gritted her teeth against the discomfort, knowing it was primarily in her imagination, and pushed on. Two hallways split off from the lobby. Wallpaper strips had peeled off the bottom half of the walls and burned, littering the room in floating embers looking for a new surface to ignite. Flames ate away at the smoke-stained sheetrock and molding accents. The lobby’s marble floors minimized the fire’s ability to spread to the furniture, but even that would be lost if the company working the hoses didn’t get to the flames fast enough. “We’ll take the left,” Jarrett said. “We’re right. As usual.” Andy rarely missed a chance to insert even a small joke into a situation. She’d thought his humor while facing the seriousness of fires would bother her, but he did a great job of keeping the more crass jokes for slightly more appropriate times at the station. “You weren’t so right when you said Delancey would do a pole dance,” Jarrett said. Three brothers and four guy cousins had given Delancey a certain insight into the male mind. Jokes about women doing all things sexual were expected, but when they were about her when they were working… The inappropriateness was just one reason she struggled to like Jarrett. Even when he was nothing more than a voice in her helmet, like now, she only ever wanted to smack him because of his arrogance. “Like I’d want to see my cousin do that,” Andy muttered as he and Delancey cleared the first room. The office turned out to be a set of interconnected offices within the space. Empty of furniture, it only took a moment before they were ready to move back to the hall. Grateful that Andy didn’t feed into the other team’s obnoxiousness, at least not at the moment, she gestured toward the second door. Andy reached for it, and when the knob wouldn’t turn he used his Tri-Bar to bust through the lock. The fire crawled along the walls and ceiling, more intense than in the front of the building as they moved deeper. The ceiling was open, exposing heavy beams that snapped and popped beneath the heat eating at their metal supports. Moving efficiently, she and Andy stepped into the next suite. It was as empty as the first. They moved on to the third. “Fire Department. If you hear me, call out,” Andy called upon entering each room. She’d heard those words before. Something about this fire was different, and it had the vault protecting her memories cracking open. Retreat and a full-time return to her physical therapy job seemed like a brilliant idea. Instead, visualizing the slamming of her heart as a drum beating the rhythm of victory, she shoved the memories down and put one foot in front of the other. Furniture and computers had been set up in the current space, but the wires dangled loose. Clearly no one was doing business there yet. They were moving toward the last office when Jarrett announced the all clear on his side. “One to go on this side,” Andy said as he nudged the partially open door wider. His eyes locked on Delancey’s and he nodded. Unlike the other suites that were set up to offer a reception area and then a private office or two, this space had been set up with a reception area, a conference room and a double office with a glass divider between two large desks. The fire was more advanced than in the rest of the building. Flames licked the doorframe and carpet leading into the double office, climbed the walls and curled along the ceiling. Beyond the fire, the room looked like a war zone with an overturned chair, drawers hanging open on a credenza and a laptop broken on the floor. A section of the glass divider had shattered—or had been shattered—littering the floor with shards. A chunk of ceiling tile fell. Delancey’s heart leapt into her throat as she jumped sideways to get out of its path. She turned to check on Andy when a groan captured her attention. Seeing that Andy was fine, she moved toward the sound. On the other side of the desk a man lay trapped beneath a fallen beam with his hand outstretched to a non-moving woman nearby. Delancey motioned for Andy to circle the other side of the desk toward the woman while she moved toward the man. His fingers moved against the floor as if he was trying to pull himself to her. He grunted, almost too quietly to be heard beneath the snapping and crackling of the fire. Memories of the past and actions required in the moment warred.